I was obsessed with having a vacation rental property, and I told all my friends. I looked at listings and talked to everyone about it, and one of the areas I felt it was a good investment was the Sunshine Coast. My friend Kika was invited to go to the Sunshine Coast in August 2015 and she fell in love with it, too! I remember her sending me pictures and saying how beautiful it was out there. She actually paid attention to details in the place she was staying and even talked to the neighbour! When she was in the ferry back to Vancouver, she met a friendly guy that said she needed to see Roberts Creek. That’s stayed in her mind. So when we decided to buy a property together (I mentioned how we got to this point in another post), the girls were assigned with scouting for properties and the boys were assigned with dealing with the financing part. I remember that day! We crossed the ferry on foot, because Gail offered to pick us up. (Check their website at joniandgail.com) First she asked us how far we wanted our property to be from the ferry. We said “maximum 45 minutes drive”. So she said we would go as far as Halfmoon Bay, then. She started showing us Gibsons, and she went on to several areas in Gibsons, Roberts Creek, Sechelt and Halfmoon Bay. We were excited. Places were beautiful. We took little roads and walked to the beach in several parts of the Coast. She explained the profile of each neighbourhood. It’s all blurry but a few parts I still remember. The one place I remember clearly was Roberts Creek. I don’t know what came first, if the beach or the Gumboot Cafe. I get goosebumps just thinking about it! It was late September. We bought a cinnamon bun and some coffee and tea and shared the cinnamon bun sitting outside the Gumboot Cafe. I remember she took us to the beach. Kika and the Gail walked ahead of me and I stayed behind, taking in the view… My God. I can feel it now. It was the most beautiful place on Earth. I just felt it. We had found our place. Later Kika and I exchanged notes and she said she felt the same. That, combined with the profile of the community and the fact that Kika had already heard on the ferry that Roberts Creek was a “must see”, we felt it was meant to be. With the place decided, now we needed to find our house. At first we even thought of building. Thank God we dismissed that idea pretty quickly. You see, if you build, you need to pay for the mortgage way ahead of renting the property, which makes it more complicated as an investment. At least for us, that didn’t have the money laying around. We wanted to start renting ASAP. Right on that first trip we saw a property we liked. It had two houses on the same property. To make that story short, we ended up losing a bid for that house. It was right when the market started getting hot in October 2015. Lots of investors started looking into the Sunshine Coast because some big investing opportunities happened at that same time. Amongst the properties we saw it was the Log House. It was priced higher than the other ones. There was only one house on the lot… and financially we could “make it”, but it wouldn’t be as profitable as the one with two houses. I remember clearly Joni (one of our realtors), Kika and I sitting on the couch in the living room. We got so comfy there. It was a beautiful sunny day. Our husbands just looked and looked and looked around. I saw the expression on Kika’s husband face… he was in love. And he doesn’t show his emotions easily! But all in all we were looking for an investment property and we decided for the other house. And we lost the bid. And we waited a bit more and I don’t remember who said it first, but we decided to go for the Log House! And the rest is history! Amazing how things are just meant to be, right? We got it all done in October. Possession Day was January 17, 2016. Our contractor moved in and renovated the kitchen, two bathrooms, the bedroom floors downstairs and the deck upstairs in about a month! Kika and I ran like crazy and got it all furnished by mid-March, just in time for Spring Break. This was not all easy as we had a new gas fireplace installed and it was challenging with the roof being so high. 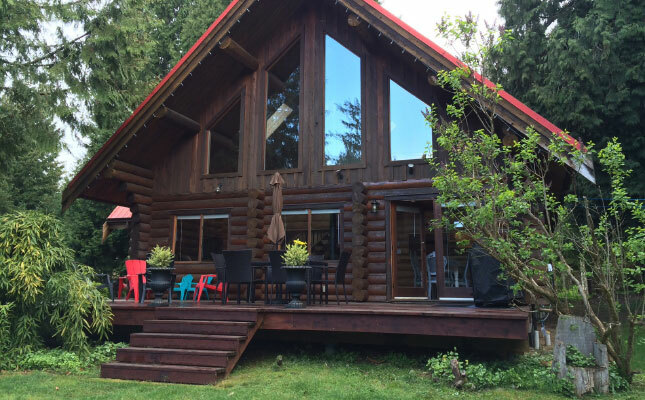 The Log House income paid for all its expenses in 2016. The “profit” was just a couple of hundred but hey, it’s not debt! We still owe ourselves a bit for some of the renovation costs, but we are all very happy that we decided to take the plunge and buy our first investment property. A few things were a bit more expensive than I expected. Insurance was our biggest expense aside from renovations. On the positive side, we are constantly booked. Most weekends are booked and to our surprise, the low season is busy as well. The only month we had almost no guests booked was January. October, November and December were stronger than we imagined. We are now more experienced going on our second year and we are very excited for the future of our Log House. We are so touched by our guests reviews and I am sure they have lots of stories and beautiful memories from our magical place. Are you afraid of cleaning? I can't say enough how helpful and productive it was to have Claudine come and help us with our rental suite. She took the guess work out. She took the time and evaluated the suite in details and looked at our lifestyle holistically. Then in a very kind way gave us the truth, what we needed to do, different options, and how to do it. The information we received was not candy coated but at the same time it wasn't overwhelming as she broke it down to small doable actions. We were not sure of long term rental or short term. Looking at our lifestyle, she told us the amount of work for each option and gave us her opinion of what she thought would work best for us. It was a great experience for both my husband and I and I'm glad he was home that day to listen to Claudine. What she said and did was way more clear than what I would have explained later. We had trouble renting our basement suite for about 3 months. After the conversation with Claudine, we worked on the suggestions she gave us and rented the place within 3 weeks. What an interesting and rich journey it has been working with Claudine. Her enthusiasm for real estate was without a doubt, the major catalyst for us to invest in a property and become business partners. She happily shared with us her experience in real estate marketing, as well as a lot of valuable information she acquired over time. Without that information we would never had invested and bought our beautiful cabin. We are thankful that she is very resourceful. One year later, we can say that we had a great time together, complementing each others’ styles and interests. Her integrity and handwork are an essential part to our successful partnership. Claudine has been our entrepreneurial diva and a source of encouragement for several years. Most recently, her enthusiasm and guidance (through her own experience of buying a rental property) helped to spark an old passion of ours... real estate investment! Almost a year after our conversation, we managed to reach something we wouldn't dare to imagine even in our wildest dreams! We bought 2 rental properties within 6 months and we are currently planning to secure the 3rd one. We know how to perform feasibility studies, risk mitigation strategies, worst case scenario assessments, breakeven studies, etc... but sooner or later "you need to jump". Claudine has been instrumental in helping us see possibilities from a different perspective. We will forever be grateful for her support, coaching, and never ending guidance. Claudine advised us to give short term rental a try after having rented our basement suite for 20 years to long term renters. We are extremely pleased with the outcome and cannot imaging going back. Want to become a property owner?